Mucopolysaccharidosis type VII (MPS VII, Sly Syndrome) is a progressive, debilitating, ultra-rare lysosomal storage disorder caused by the deficiency of β-glucuronidase (GUS), an enzyme required for breakdown of glycosaminoglycans (GAGs). Vestronidase alfa, a recombinant human GUS, is an enzyme replacement therapy approved in the US and EU for the treatment of MPS VII. The pharmacokinetics (PK) and pharmacodynamics (PD) of vestronidase alfa were evaluated in 23 adult and pediatric subjects with MPS VII enrolled in phase I–III clinical trials to optimize the clinical dosing regimen of vestronidase alfa. 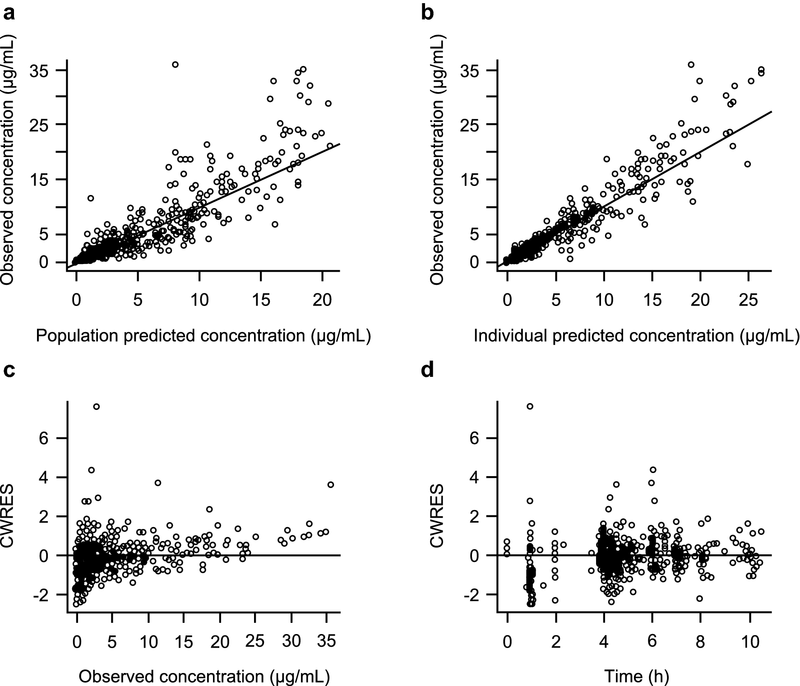 The serum concentration-time profiles were adequately described by a two-compartment population PK model incorporating subjects’ body weight as the only significant covariate. 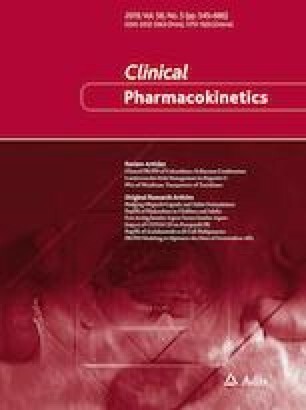 Model-based simulations predicted a substantially decreased time duration of serum exposures exceeding the level of Kuptake (the in vitro determined vestronidase alfa concentration corresponding to 50% maximum rate of cellular uptake) for 4 or 8 mg/kg once every 4 weeks dosing, compared with 4 mg/kg once every other week (QOW) dosing by intravenous infusion, suggesting that given the same total monthly dose, the QOW dosing frequency should result in more efficient delivery to the GUS-deficient tissue cells, and therefore superior treatment efficacy. A standard inhibitory maximal effect model reasonably explained the observed pharmacological PD responses of reduction in urinary GAGs from pretreatment baseline, which appeared to have reached the plateau of maximal effect at the 4 mg/kg QOW dose. The modeling results, together with the clinical evidence of safety and efficacy, supported the recommended 4 mg/kg QOW dosing regimen of vestronidase alfa for pediatric and adult patients with MPS VII. Yulan Qi, Christine Haller, Wenjie Song: Affiliation at the time of the study. The online version of this article ( https://doi.org/10.1007/s40262-018-0721-y) contains supplementary material, which is available to authorized users. The pharmacokinetics and pharmacodynamic characteristics of vestronidase alfa, the first and only specific treatment for mucopolysaccharidosis VII (Sly Syndrome; an ultra-rare inherited lysosomal disorder) approved in the US and EU were reported for the first time. Results of modeling and simulations supported the recommended body weight-based dosing regimen of vestronidase alfa, which is 4 mg/kg every other week by infusion regardless of age. A higher dose likely will not further increase the treatment benefit, whereas reducing dosing frequency to once every 4 weeks may result in partial loss of efficacy, even if the total monthly dose amount is maintained at 8 mg/kg. Mucopolysaccharidosis type VII (MPS VII), also called Sly Syndrome, is an ultra-rare lysosomal storage disease caused by deficiency of β-glucuronidase (GUS) [1, 2]. In the absence of activity of GUS, which is required for degradation of the glycosaminoglycans (GAGs) dermatan sulfate (DS), chondroitin sulfate (CS), and heparan sulfate, progressive accumulation of these GAGs lead to dysfunction of numerous tissues and organs. MPS VII frequently presents with hydrops fetalis at birth and manifests with variable signs and symptoms, including abnormal coarsened facies, pulmonary disease, cardiovascular complications, hepatosplenomegaly, joint stiffness, short stature, cognitive impairment, and skeletal abnormalities . Enzyme replacement therapy (ERT) by intravenous infusion of vestronidase alfa (recombinant human β-glucuronidase, or rhGUS) was developed for the treatment of MPS VII based on successes in treating other MPS types with ERT [4, 5, 6, 7] and on objective improvements using ERT with vestronidase alfa in mouse models of MPS VII [8, 9, 10]. The clinical development program faced challenges owing to the extreme rarity of the disease, its phenotypic diversity, and the lack of a single outcome to measure clinical efficacy. Nevertheless, a preliminary indication of efficacy and safety of vestronidase alfa in a patient with MPS VII was observed in an early case of compassionate use . The efficacy and safety of vestronidase alfa have since been evaluated in four clinical trials. In an open-label, phase I/II, dose-finding trial (ClinicalTrials.gov identifier: NCT02418455), 4 mg/kg of intravenous vestronidase alfa every other week (QOW) was found to provide maximal reduction in urinary GAGs (uGAGs) without any significant safety concerns. Additional evidence of the long-term safety and efficacy of vestronidase alfa was provided in an open-label, phase II trial in subjects < 5 years of age . Vestronidase alfa was approved by the US FDA and the European Medicines Agency (EMA) for treatment of MPS VII following the demonstration of efficacy and safety results in a randomized, placebo-controlled, blind-start, phase III trial [12, 13]. In all three trials, sustained reductions in uGAGs were observed in all subjects and measurable clinical responses were observed in most. There were no discontinuations of treatment due to an adverse event (AE). No significant safety concerns have been identified for vestronidase alfa when properly administered with antihistamine premedication, infusion rate titration, and close patient monitoring. In the phase III study, 7 of 12 subjects tested positive for antidrug antibodies (ADA), including 6 of 7 in which they were treatment emergent, but no associations were evident between ADA and either immune-mediated AEs or reductions in uGAGs. Herein, we report the pharmacokinetics (PK) and pharmacodynamics (PD) of vestronidase alfa in subjects included in the phase III study and two earlier phase I/II studies. Because MPS VII is an ultra-rare disease, limited clinical evaluation of different dosing regimens of vestronidase alfa was conducted for the QOW dosing frequency at the dose level of 1, 2, and 4 mg/kg in a small number (N = 3) of patients. The main objective of this study was to utilize modeling and simulations to inform selection of the optimal dosing regimen of vestronidase alfa for pediatric and adult patients with MPS VII. The safety, efficacy, and PK and PD of vestronidase alfa were evaluated in a total of 23 subjects with MPS VII who participated in three clinical studies (Fig. 1). Briefly, study 1 was a phase I/II, open-label study to assess the safety, efficacy, and optimal dose of vestronidase alfa in subjects aged between 5 and 30 years with MPS VII (ClinicalTrials.gov identifier: NCT01856218). Subjects were administered 2 mg/kg vestronidase alfa intravenously QOW for 12 weeks, followed sequentially by forced-dose titration periods to evaluate other doses ranging from 1 to 4 mg/kg QOW (1 mg/kg for 8 weeks, 4 mg/kg QOW for 8 weeks, and 2 mg/kg QOW for 8 weeks), and finally a long-term extension period with 2 mg/kg QOW for 36 weeks. Study 2 was a phase II, open-label study to assess safety, efficacy and PK/PD in subjects < 5 years of age with MPS VII (ClinicalTrials.gov identifier: NCT02418455). Subjects received 4 mg/kg vestronidase alfa intravenously QOW for 24 weeks. Study 3 was a phase III, randomized, placebo-controlled, blind-start (i.e. blinded crossover from placebo to active treatment) study to assess the efficacy and safety of vestronidase alfa in subjects aged between 5 and 35 years with MPS VII (ClinicalTrials.gov identifier: NCT02230566) . Subjects were randomized to one of four treatment groups (Groups A–D). 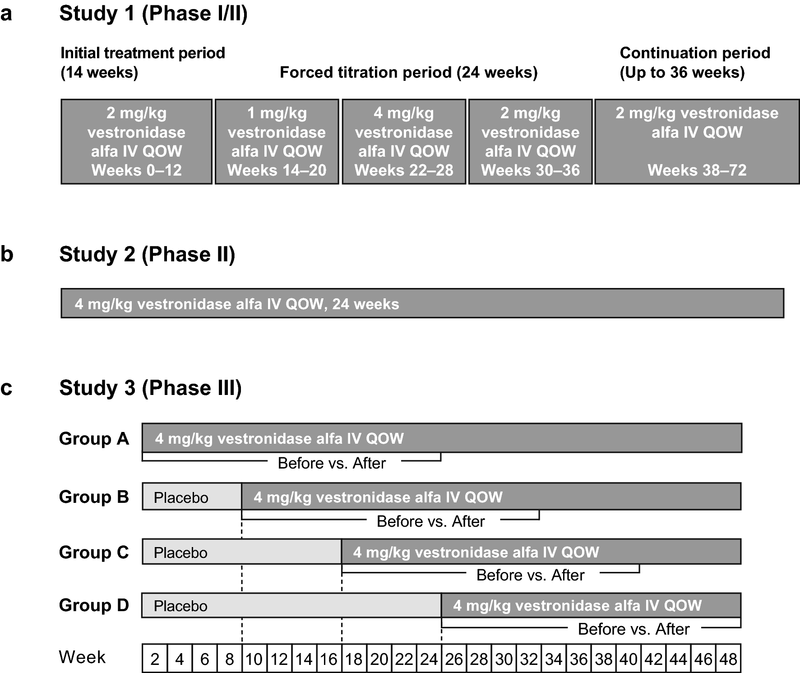 Subjects in group A received 4 mg/kg vestronidase alfa intravenously QOW for 48 weeks, while subjects in groups B, C, and D received placebo QOW for 8, 16, and 24 weeks, respectively, before initiating treatment with 4 mg/kg vestronidase alfa QOW for the remainder of the 48-week treatment period. Intravenous administration of vestronidase alfa was performed over a period of approximately 4 h, with the first 2.5% of the total administration volume infused over the first hour. In study 1, venous blood samples for PK analyses of serum were collected at weeks 0 (baseline), 12 (the end of the initial treatment period), 20, 28 (end of each of the first two forced-titration periods, 36 (2 weeks prior to the end of the third forced-titration period), and 84. Sampling was performed predose (within 15 min prior to infusion), at 60 and 120 min after the start of infusion, at the end of infusion (within 5 min prior to the end of infusion), and 5, 15, 30, 60, 120, 180, 360, and 480 min after the end of infusion. In study 2, venous blood samples for PK analyses of serum were collected at weeks 0 (baseline), 24 and 48. The sparse sampling regimen for each included samples collected predose (within 15 min prior to infusion), at 60 min after the start of infusion, at the end of infusion (within 5 min prior to the end of infusion), as well as 30–120 min after the end of infusion and 4–6 h after the end of infusion. In study 3, blood samples were collected at weeks 0 (baseline), 8, 16, 24, 36, and 46 (all within 15 min prior to infusion). In addition, samples collected at weeks 16, 24, and 46 included collections 1 h after the start of infusion, the end of infusion (within 5 min prior to the end of infusion), and 5, 15, 30, 60, 120, 180, 360, and 480 min after the end of infusion. The serum samples were analyzed for vestronidase alfa enzyme activity using a validated fluorescence-based assay method, and a specific activity value of 4000 U/µg was used to convert the concentration expressed in U/mL into µg/mL (Electronic Supplementary Methods S1.1). Blood samples for analyses of ADA and neutralizing antibodies (NAb) in serum were collected on schedules as follows: (1) study 1: at baseline (week 0) and before infusion at weeks 4, 8, 12, 22, 30, and 36; (2) study 2: at weeks 0 (baseline), 8, 16, 24, 32, 40; (3) study 3: at randomization and before infusion at weeks 4, 8, 12, 16, 18, 20, 24, 28, 32, 36, 40, and 46. Immunogenicity of vestronidase alfa (analyzed by BioAgilytix Labs, Durham, NC, USA) was evaluated by quantifying total ADA, independent of isotype, in human serum, using a bridging electrochemiluminescent (ECL) assay and a three-tiered strategy: screening assay, specificity confirmation assay, and titer assay (Electronic Supplementary Methods S1.2). Subject samples showing the presence of ADA in the screening assay step were analyzed in the confirmatory format to test for specificity against vestronidase alfa. Samples that were positive in the confirmatory assay step were then tested for titer. The titer assay used the same format as the screening assay, with the samples being tested in a series of twofold dilutions starting at 1:10. The last dilution with a positive ECL signal above the assay cut point was reported as the titer value for the sample. Subject samples in which ADA were confirmed were assayed for NAb (Electronic Supplementary Methods S1.3).The cell-based enzyme uptake assay was qualitative, with the results reported as either positive or negative. In samples collected at representative steady-state visits, creatinine-corrected uGAG CS and DS were quantitatively assessed using a validated liquid chromatography with tandem mass spectrometry assay (Electronic Supplementary Methods S1.4). Samples for analysis from each study were collected as follows: (1) study 1: weeks 0 (baseline), 12, 20, 28, 36, and 84; (2) study 2: weeks 0 (baseline), 4, 8, 12, 18, 24, 30, 36, 42, and 48; (3) study 3: weeks 0 (baseline), 8, 16, 24, 36, and 46. PK and PD analyses were conducted using pooled data from studies 1, 2, and 3. PK and PD analyses were conducted by nonlinear mixed-effect modeling using NONMEM software (ICON Development Solutions, Ellicott City, MD, USA), and data processing and plotting were performed using the R program (R Foundation for Statistical Computing, Vienna, Austria). The stochastic approximation expectation-maximization, followed by importance sampling estimation methods, was used for PK parameter estimation. where θi is the PK parameter for the ith subject, θTV is the typical value of the parameter, and ηi is a normally distributed variable with mean 0 and variance ω2. Covariates such as subject demographics and laboratory test results were evaluated in the PK model development. Neutralizing anti-vestronidase alfa antibody (NAb) was tested as a categorical covariate: a subject who tested positive for NAb on or before a particular PK visit week was considered to have developed a positive NAb response to vestronidase alfa and was classified as NAb-positive thereafter. In addition, ADA titer at PK visit weeks was also considered either as a continuous time-varying covariate or used to classify immunogenicity status at a particular PK visit week as ADA-positive or -negative. where the dependent variable (DV) is observed PK values, individual predicted value (IPRED) is the individual predictions for PK values, and ε is a normally distributed variable with mean 0 and variance σ2. The performance of the final PK model was verified by applying a visual predictive check (VPC) to confirm that the simulated data are centered around the medians of the observed data. The stability and performance of the final PopPK model was also evaluated using nonparametric bootstrap analysis by generating 1000 data sets through random sampling with replacement from the original data using the individual as the sampling unit. Population parameters for each data set were estimated using NONMEM. This resulted in a distribution of estimates for each population model parameter. Empirical 95% confidence intervals were constructed by obtaining the 2.5th and 97.5th quantiles of the resulting parameter distributions. The finalized PopPK model was used to simulate several different dosing regimens in order to potentially ascertain the comparative treatment efficacy by estimating the efficiency in cellular uptake of vestronidase alfa. Steady-state serum concentration-time profiles were simulated for three dose regimens: 4 mg/kg/QOW with a 4-h infusion; 4 mg/kg/month (Q4W) with a 4-h infusion, and 8 mg/kg/Q4 W with a 4-h infusion. To mimic clinical practice, the infusion rates of vestronidase alfa provided 2.5% of the total dose over the first hour, with the remaining 97.5% administered over the last 3 h of the infusion. Profiles were simulated for a total of 24 months (either 24 monthly doses or 48 QOW doses). Summary demographic or covariate information were used to simulate concentration-time profiles for the typical subject based on covariate effects contained within the final PopPK model. where I is the drug inhibitory effect (percentage reduction in uCS or uDS) at a certain vestronidase alfa serum exposure (AUC from time 0 to t), I0 is the no-drug response and fixed to 0 in the model, Imax is the maximal drug effect in percentage decrease in uCS or uDS, and IC50 is the AUC of vestronidase alfa that achieves 50% of the maximum drug effect. Due to the rarity of MPS VII and the small number of subjects in this trial, individual patient data will not be shared in order to safeguard patient privacy. The study protocol and statistical analysis plan for this study may be available on the relevant regulatory authority websites as required upon study completion. The analysis included 3 subjects from study 1, 8 subjects from study 2, and 12 subjects from study 3 with MPS VII. The demographic characteristics and laboratory test results of subjects are shown in Table 1. The PopPK model of vestronidase alfa was informed by intensively (n = 15) or sparsely (n = 8) sampled vestronidase alfa serum concentrations in 23 MPS VII subjects who participated in the three clinical trials. In all cases, intravenous administrations of vestronidase alfa were performed over an approximately 4-h period. The parameter estimates of the final PopPK model are presented in Table 2. The clinical PK data of vestronidase alfa were best described by a two-compartment distribution model with zero-order input and linear elimination from the central compartment. There was no evidence to suggest nonlinear elimination in the observed concentration-time profiles. A model testing combined linear and nonlinear elimination was found to provide no statistical improvement in data fitting compared with the simpler nestled model describing only linear elimination. This modeling conclusion was in full agreement with a dose-proportionality analysis conducted previously based on NCA PK results which showed that the dose-normalized exposures (maximum concentration [Cmax] and AUC) of vestronidase alfa were comparable among the three doses tested in study 1 (Electronic Supplementary Figure 1). The goodness-of-fit plots indicated that the final model well-described the observed data (Fig. 2). The final PK model parameters were estimated with acceptable precision as indicated by relative standard error. Typical PK parameter value estimates for serum clearance (CL), intercompartment clearance (Q), and volume of distribution in the central (Vc) and peripheral compartment (Vp) were 1.97 L/h, 0.931 L/h, 1.52 L, and 3.11 L, respectively, for an MPS VII subject with a baseline body weight (BWT) of 20 kg. These typical values of CL and total volume of distribution at steady state (Vss = Vc + Vp) after correcting for the median BWT in the dataset (24.8 kg) were 0.079 L/h/kg and 0.19 L/kg, respectively. The model estimated terminal-phase disposition half-life (t½) in serum was estimated to be approximately 3.6 h. The primary and derived PK parameter typical values from the population model were in good agreement with those derived from the NCA analysis (CL = 0.07 L/h/kg, Vss = 0.23 L/kg, t½ = 2.5 h; data on file). Of the 23 subjects included in the analysis, 8 tested positive for NAb on at least one visit. Covariate analysis was conducted to investigate the eight subjects with positive NAb in comparison with those without a positive NAb record (n = 15) and no significant impact of NAb on vestronidase alfa serum CL was found. In addition, there was no trend of CL versus titers of ADA, suggesting no significant impact of ADA on vestronidase alfa CL. Other covariates such as patient demographics, and laboratory test results were also evaluated and BWT was the only covariate significantly affecting vestronidase alfa PK. The estimates of allometric BWT scalars for clearances (CL and Q) and volumes (Vc and Vp) were 0.59 and 0.48, respectively, suggesting vestronidase alfa disposition is body weight-dependent and a body weight-based dosing regimen is appropriate. The final PopPK model was evaluated by VPC (Fig. 3) and nonparametric bootstrap (Table 2). Overall, the model reasonably explained observed vestronidase alfa PK profiles across all studies, with the vast majority of data contained within the 95% predictive interval. From the bootstrap analysis, 869 (86.9%) of the 1000 NONMEM runs converged successfully within the specified 1000 iterations. The model and bootstrap produced essentially identical parameter value estimates with similar variability associated, demonstrating the robustness of the final Pop PK model. As the final Pop PK model contained only BWT as a covariate, the median value of 24.8 kg was used when simulating 500 serum vestronidase alfa concentration-time profiles for each of the three dose regimens: 4 mg/kg QOW with a 4-h infusion, 4 mg/kg Q4 W with a 4-h infusion, and 8 mg/kg Q4W with a 4-h infusion. Simulation results comparing Cmax and the time > 0.3 µg/mL (Kuptake value for vestronidase alfa, at which concentration the receptor-mediated cellular uptake rate reaches 50% of the maximal value) for the three dose regimens are shown in Table 3. The Cmax values were well above Kuptake (> 12.5-fold) for all three regimens. However, compared with the clinically demonstrated 4 mg/kg QOW regimen, 4 mg/kg Q4W or 8 mg/kg Q4W with a 4-h infusion had a significantly shorter duration of maintaining the serum vestronidase alfa level above Kuptake (50% and 40% decrease, respectively). It is reasonable to assume that the rate of cellular uptake of vestronidase alfa will become saturated when the vestronidase alfa serum concentration is in large excess compared to Kuptake. Therefore, avoiding an excessively high peak concentration and maintaining a longer duration of a moderate serum exposure of vestronidase alfa above Kuptake is critical in maximizing the percentage cellular uptake of the total dose administered. The simulation results predicted that the 4 mg/kg QOW dosing would maintain the serum exposure of vestronidase alfa over the critical Kuptake value for a substantially longer time period by approximately twofold compared with 8 mg/kg Q4W, which has the equivalent total monthly dose. Hence, the QOW dosing frequency will likely provide greater percentage of dose drug delivery to tissue cells deficient of GUS for better clinical efficacy. Reduction in urine GAGs was the PD endpoint and one of the primary efficacy endpoints in the clinical trials. Significant decreases in urinary CS and DS were observed in subjects who received vestronidase alfa. An inhibitory maximal effect model reasonably described the relationship between the serum exposure of vestronidase alfa and the percentage reduction from baseline for both uCS and uDS. The following parameter estimates were obtained: IC50 was 8.6 and 7.3 µg h/mL for uCS and uDS, respectively, and estimated Imax was 82.0% and 76.9% for uCS and uDS, respectively. All PD parameters were estimated with acceptable coefficients of variance for precision, and interindividual variability was estimable for Imax only (Table 4), likely due to limited subject numbers enrolled in the clinical studies as a result of the ultra-rare prevalence of MPS VII. The relationship of the observed uGAG changes from baseline and individual post hoc estimated exposure of vestronidase alfa is shown in Fig. 4. Among the three doses studied in clinical trials, the highest dose (4 mg/kg QOW) was associated with greater PK exposures and PD responses, compared with the two lower doses (1 and 2 mg/kg QOW). A flat exposure–response relationship was also observed for the range of vestronidase alfa serum exposure above a certain cut-off value approximately corresponding to AUC at 40 µg h/mL. 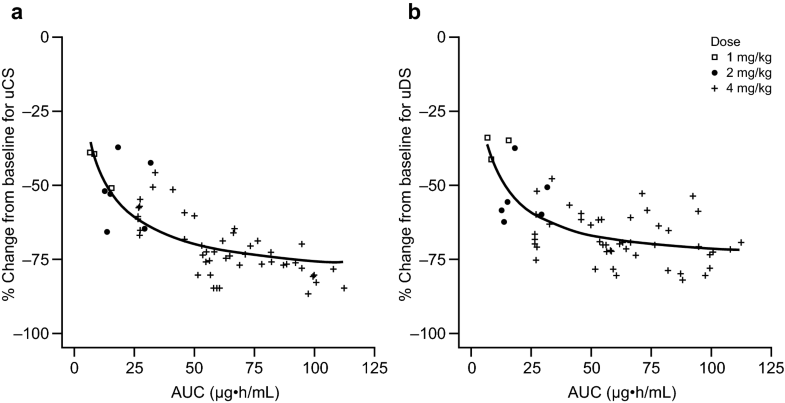 This cut-off vestronidase alfa exposure level is well exceeded at the 4 mg/kg QOW dose as the typical mean steady-state AUC values were 57.9 µg h/mL, suggesting that the magnitude of uGAG reduction had likely reached its plateau at 4 mg/kg. Because MPS VII is an ultra-rare disease, an extensive dose exploration in a large patient population was not possible, and therefore PK/PD modeling and simulations was used to determine the optimal dose regimen. Using the data from patients included in the vestronidase alfa clinical development program, the analyses supported the body weight-based dosing regimen of vestronidase alfa recommended in prescribing information in the US . Comparable serum PK profiles were observed in the MPS VII subjects throughout the treatment course with repeat QOW infusions, suggesting that vestronidase alfa disposition is time-independent. Systemic accumulation of vestronidase alfa in the serum compartment was not observed with QOW administrations, as consistent with the short elimination t½ of this enzyme in circulation. Based on doses evaluated in the PopPK model, the PK of vestronidase alfa was linear in the dose range from 1–4 mg/kg, with dose proportional exposure and constant CL independent of concentration. The typical weight-normalized CL value of approximately 0.079 L/h/kg was similar to those reported for other ERTs used to treat different MPS diseases, such as laronidase for MPS I, idursulfase for MPS II, and galsulfase for MPS VI [15, 16, 17]. 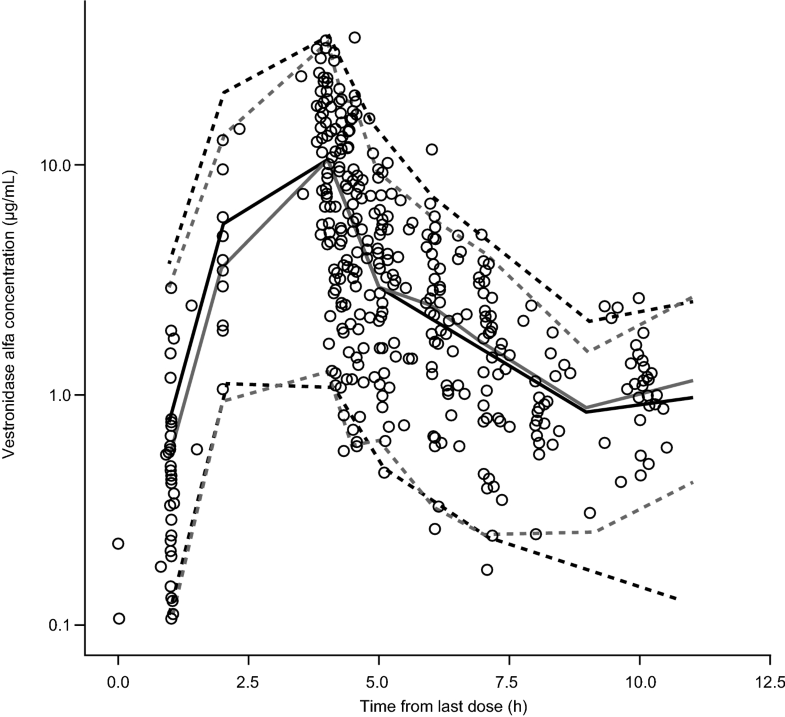 Vestronidase alfa also exhibited comparable Vss values to those MPS ERTs, with a typical value of approximately 0.19 L/kg, suggesting limited extravascular distribution approximately within the extracellular water volume. BWT was the only covariate significantly affecting the PK of vestronidase alfa. The estimates of allometric BWT scalars for clearances (CL and Q) and volumes (Vc and Vp) were 0.59 and 0.48, respectively, suggesting a body weight-based dose is appropriate. The weight-based dose was supported by comparable exposures in individual subjects administered at 4 mg/kg across studies regardless of age or body weight. In particular, in study 2, which enrolled younger subjects (< 5 years of age), the observed exposures were comparable with those in older subjects (≥ 5 years of age) in studies 1 and 3 (Electronic Supplementary Figure 2). No significant impact of immunogenicity on vestronidase alfa PK was detected. The intracellular t½ of vestronidase alfa estimated from an in vitro study using human fibroblasts is 23–43 days (data on file), which is longer than several other ERTs (e.g. laronidase: 5 days ; galsulfase: 2–4 days ; elosulfase alfa, 5–7 days ). Together with the increased uptake associated with higher serum concentrations, this might initially be considered as supportive of a less frequent dosing regimen using a higher dose; however, this is unlikely to be appropriate for several reasons. Different cell types have variable turnover rates that can be as short as 2 days , whereas the terminal elimination t½ of vestronidase alfa in plasma is approximately 2.5 h  and therefore once-monthly dosing would be unlikely to allow sufficient exposure to, and accumulation in, more rapidly cycling cells. Instead, less frequent dosing with 8 mg/kg may be associated with greater fluctuation in uGAG levels, which is likely to be associated with suboptimal clinical benefit. In the vestronidase alfa clinical development program, the 4 mg/kg QOW dose regimen has demonstrated a significant and consistent reduction in uGAG, along with other clinically meaningful improvements in disease manifestations in MPS VII patients with an acceptable safety profile [12, 14]. Modeling results suggest that the magnitude of uGAG reduction appears to have reached its plateau of maximum reduction at the dose of 4 mg/kg QOW, implying that any further dose increase would not be expected to improve treatment results. Collectively, the modeling results support the recommended 4 mg/kg QOW dose as stated in vestronidase alfa prescription information in the US . The impact of ADA on PK has been investigated for other ERTs and different results have been reported [20, 22, 23, 24]. The impact of antibodies on the PK appears to be variable according to the therapeutic protein considered. In this analysis, neither the total ADA nor NAb has shown significant impact on serum vestronidase alfa PK. Although there are limitations posed by the relatively small number of subjects, the lack of impact on serum vestronidase alfa PK by immunogenicity is further supported by the time-independence of serum vestronidase alfa PK. More importantly, reductions of uGAGs were maintained throughout the trials, even in subjects with positive NAb. The lack of impact of NAb on vestronidase alfa serum concentrations, which was measured by an enzyme activity assay, suggested that the neutralizing effect of NAb was negligible. NAb titers were not measured in the clinical studies of vestronidase alfa. However, based on the low incidence and transient occurrence of NAb detected, the actual levels of NAb are likely very low in subjects with intermittent positive NAb status, which may explain its lack of discernible impact on vestronidase alfa PK. In summary, there was no evidence to suggest that either vestronidase alfa PK or its treatment efficacy was significantly affected by the development of ADA or NAb. A PopPK model was developed to characterize vestronidase alfa disposition from serum in subjects with MPS VII, and results suggest that body weight-based dosing is appropriate. Model-based PK simulations support QOW as the optimal dosing frequency. An exposure–response analysis further revealed that the 4 mg/kg QOW dose is associated with maximized PD and efficacy response. Together with clinical evidence of safety and efficacy, the recommended dosing regimen is 4 mg/kg QOW for vestronidase alfa. The authors thank the patients and their families who participated in the studies, as well as the investigators and site staff at each investigational site. Medical writing support for this manuscript was provided by Ed Parr, PhD, of Envision Scientific Solutions, and was funded by Ultragenyx Pharmaceutical Inc.
All authors were involved in the analysis and interpretation of data, drafting of the manuscript, and critical revisions of the manuscript for important intellectual content. These studies were funded by Ultragenyx Pharmaceutical Inc.
Study protocols for all procedures performed in studies involving human participants were reviewed and approved by Institutional Review Boards at each investigational site, and conducted in accordance with principles in the Declaration of Helsinki and the International Council for Harmonisation of Technical Requirements for Pharmaceuticals for Human Use Good Clinical Practice guidelines. Yulan Qi, Wenjie Song, and Christine Haller were employees of Ultragenyx Pharmaceutical Inc. at the time of the study. Kathleen McKeever, Julie Taylor, and Jack Shi are employees of Ultragenyx Pharmaceutical Inc. Simon A. Jones has been an investigator and consultant for Ultragenyx Pharmaceutical Inc.
Each participant or his/her legally authorized representative provided written informed consent before entering the study, in compliance with the applicable local regulations. Ultragenyx Pharmaceutical Inc. MEPSEVIITM (vestronidase alfa-vjbk) prescribing information. 2017. https://www.accessdata.fda.gov/drugsatfda_docs/label/2017/761047s000lbl.pdf. Accessed 25 Apr 2018. BioMarin. NAGLAZYME® (galsulfase) prescribing information. 2013. https://www.accessdata.fda.gov/drugsatfda_docs/label/2013/125117s111lbl.pdf. Accessed 19 Dec 2017. BioMarin/Genzyme LLC. ALDURAZYME® prescribing information. 2013. https://www.aldurazyme.com/patients.aspx. Accessed 19 Dec 2017. Shire Human Genetic Therapies I. ELAPRASE® (idursulfase) prescribing information. 2013. http://pi.shirecontent.com/PI/PDFs/Elaprase_USA_ENG.pdf. Accessed 19 Dec 2017. US Food and Drug Adminstration. Laronidase for the treatment of mucopolysaccharidosis I; Clinical review (Advisory Committee Briefing Document). 2002. https://web.archive.org/web/20170114035825/http://www.fda.gov/downloads/Drugs/DevelopmentApprovalProcess/HowDrugsareDevelopedandApproved/ApprovalApplications/TherapeuticBiologicApplications/ucm083695.pdf. Accessed 14 Nov 2018.